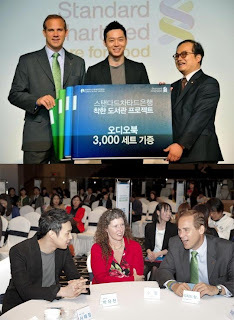 After becoming a voice for the blind, JYJ’s Park Yoo Chun participated in a very special ceremony, where he helped donate 3,000 audiobooks. On April 18, Standard Charter Bank held a publication party for the ‘Good Library Project Season 2.’ During this celebration, a total of 3,000 audiobooks, created by ordinary citizens, were donated to the Korea Society for the Welfare of the Visually Handicapped. Richard Hill, the CEO of Standard Charter Bank, stated that with the ‘Good Library Project,’ he was greatly inspired by the contributions made by the nation in donating their time and talent. The books will be available at all schools for the blind nationwide, as well as online. as much as I love how the members are always donating money and helping those in need, CJES seems to be always wanting to use that fact as a "show off" tool to announce to the world....the best type of donators are the ones that don't say anything at all and do it out of the goodness of their hearts rather than as a promotional tactic...I hope that CJES learns this and realizes how humble our boys have always been and still are.